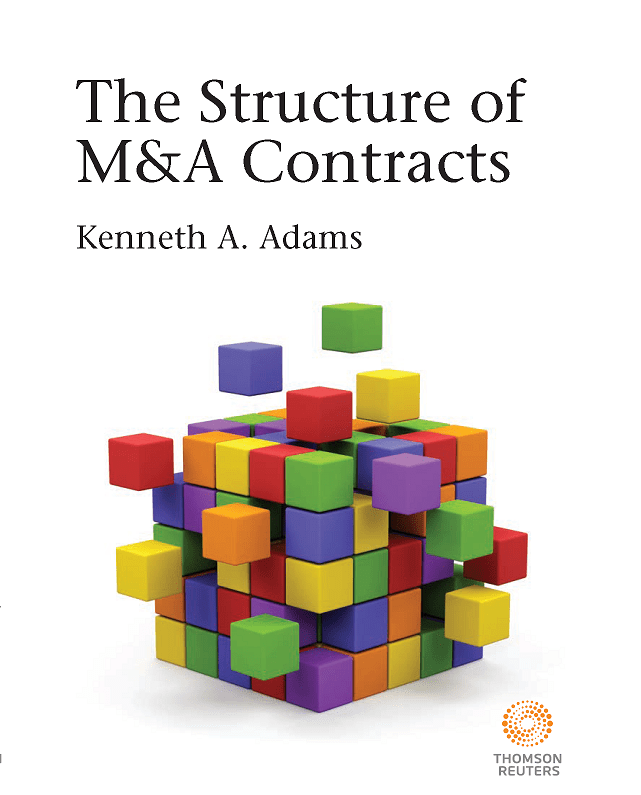 Ken Adams is the author of The Structure of M&A Contracts (Thomson Reuters 2011). This book offers a detailed and practical account of how the parts of a mergers-and-acquisitions contract fit together. Ken brings to bear on this subject the innovative approach that is on display in his book A Manual of Style for Contract Drafting. Anyone involved in M&A transactions would find this book valuable. 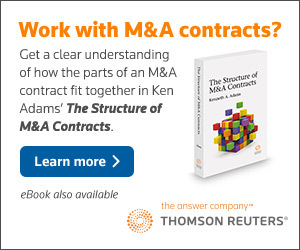 The Structure of M&A Contracts is available from Thomson Reuters in print and as a ProView™ ebook. If you’re based in the United States, go here to purchase the print version; to purchase the ebook, go here. Alternatively, please call 1-888-728-7678 and specify which version of the book you’re interested in. The print version uses a small format, so the figures are small, with small type. And the figures are a big part of the book. So go here for a PDF version of the figures; if you buy the print version of the book, you might want to consult a printout of the PDF. If you’re outside the United States, go here to find your regional sales office, then call or email them. After purchasing the ebook you’ll have to set up a Westlaw OnePass and download the free ProView app. For information on Thomson Reuters ProView ebooks in general, please visit www.legalsolutions.com/proview. You get a 20% discount if you buy in bulk. If you’d like to buy at least 20 copies, of either the print version or the ebook, please contact Beth Murthy of Thomson Reuters, atelizabeth.murthy@thomsonreuters.com and at +1-651-687-3556. This book will quickly become a go-to reference for anyone in the M&A agreement business. Not only is it one of the clearest and most practical guides to drafting agreements that work, it also provokes and advances the art with suggestions for improving current standards, many of which I believe will be adopted over time. The book is deserving of the highest praise I can bestow—I learned something from it. Ken Adams has once again produced a work that is both thought-provoking and worthwhile. I highly recommend The Structure of M&A Contracts to anyone who has an interest in drafting better contracts. 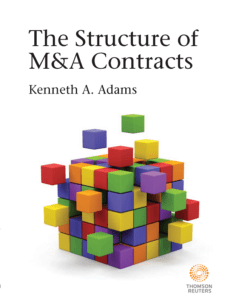 Ken Adams does an outstanding job of describing the background of and interplay between the various provisions in M&A agreements. It’s a terrific resource, for young as well as seasoned M&A lawyers, on properly structuring, drafting, and negotiating M&A agreements. This book considers the function of the different categories of provisions in a mergers-and-acquisitions (or M&A) contract and the interplay among them. These are topics worthy of study: A slight change of phrasing in one part of a contract can have important implications for other parts of the contract. And issues relating to contract structure arise routinely in M&A negotiations. This book is intended for anyone who wishes to understand the structure of M&A contracts. 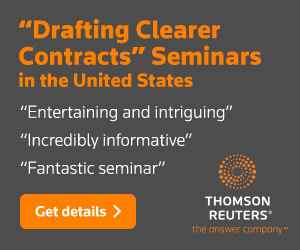 That obviously includes junior lawyers—they’re the ones who do most of the drafting of M&A contracts. And they could certainly use some help. Many junior lawyers receive little formal training in the structure of M&A contracts, and what instruction they do receive likely features a generous helping of stale conventional wisdom. And the convulsions of the U.S. legal profession in recent years have made it less likely that a junior lawyer will receive meaningful mentoring. This book should help junior lawyers take control of the drafting process, instead of regurgitating precedent contracts of questionable quality and relevance. It should also help them understand what’s going on during negotiations. Senior lawyers who have the time and inclination to revisit how they handle the structure of M&A contracts should also find this book useful. And because other kinds of contracts—such as securities purchase agreements and loan agreements—can exhibit a structure comparable to that of M&A contracts, this book might be of interest to anyone involved in transactions featuring an interval between signing and closing. The benefits of a clearer understanding of how to structure an M&A contract go beyond making life easier for the drafter. If those doing the drafting and reviewing have a better grasp of the subject, contracts would be clearer and would address the parties’ concerns more effectively; negotiations would be more efficient and less contentious; and disputes would arise less frequently. Others have written about the structure of M&A contracts, but five features serve to distinguish this book. First, its limited scope permits a more cohesive treatment than would be possible in a broader work. Second, rather than simply cataloguing the structures—good, bad, and indifferent—on display in M&A contracts, it identifies those that work best. Third, it specifies what contract language you should use in a given context and what contract language you should avoid; the recommended language complies with the guidelines contained in the author’s A Manual of Style for Contract Drafting. Fourth, it presents some of its analysis in a series of figures, so as to make it easier to understand. And fifth, it doesn’t hesitate to depart from the conventional wisdom. And it has a foreword by Steven Davidoff Solomon. What more could you want!